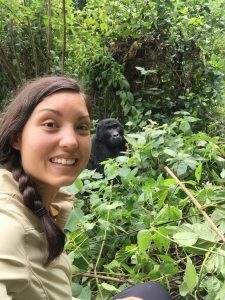 She was traveling with nine other vet students and Andrew Stringer, the CVM’s director of global health education and a clinical assistant professor in the Department of Population Health and Pathobiology, when she saw veterinarians working to save critically endangered mountain gorillas. Their approach was to focus on public health concerns in the country, including access to birth control and battling entrenched poverty. “By providing education on family planning and giving small loans to start coffee farms, local families were poaching less, sending their children to school and becoming empowered,” said Sanabria. When she got back to the United States, Sanabria immediately began looking into jobs for public health veterinarians. Now, a new, unique joint master’s program will help prepare her for her many journeys to come. Sanabria is the first CVM student accepted into the master’s of public health with global health emphasis program, a collaboration between the CVM and the University of North Carolina at Chapel Hill’s Gillings School of Public Health. Launching this fall, the program combines the CVM’s four-year veterinary curriculum with a yearlong, intensive master’s of public health program at UNC’s top-ranked public health school. For the program, Sanabria received a UNC Graduate Merit Assistantship Scholarship, which will cover a significant portion of tuition and fees. The program plans to accept up to three CVM students a year. Students are eligible after their second or third year of vet school. 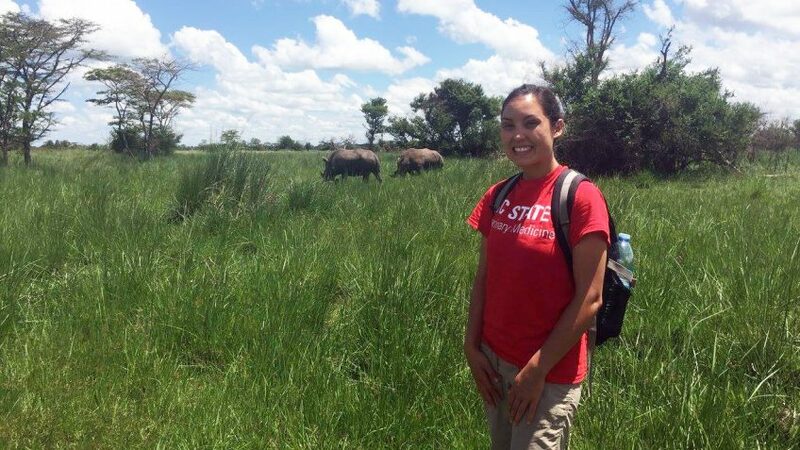 Sanabria will complete course work at UNC with third-year medical students enrolled in the program, with a spring semester of field work related to a research topic of interest. Electives in the program cover such material as critical issues in global public health and ethics. After completing the master’s program, Sanabria will return to DVM work, where she will now be a part of the CVM Class of 2021, and continue to focus on epidemiology, public health and public policy. A Southern California native who moved to the Asheville area when she was 11, Sanabria attended Duke University for her undergraduate degree in biology, with dual Spanish and chemistry minors. Intending to focus on small animal medicine or shelter medicine at veterinary school, she volunteered with small animal veterinarians at at local shelters while at Duke. Her favorite experience while in undergrad was studying abroad in Ecuador. There, she investigated the unique ecosystems of the country, including the biodiversity of the cloud forests and Amazon rainforests, Alpine tundras and the Galápagos Islands. The MPH program will help Sanabria achieve a new goal: becoming a veterinary epidemiologist with the Centers for Disease Control and Prevention. It’s a career that usually requires a master’s degree in public health, and within the new program Sanabria is particularly interested in mathematical modeling to analyze patterns of infectious disease. It’s also a career that will allow her to travel the world to study infectious agents impacting human and animal health. For more information on the NC State CVM/UNC Gillings MPH with Global Health Emphasis program, go here.